It was a race against the sun that I knew I could win! That windy highway between Cannon Beach & Neah-Kah-Nie Mountain had nothing on me. Its funny, even after all these years, I knew those corners like the back of my hand. Driving through the forest, I realized that all the trees & bushes looked the same as I remembered. Once I thought about it, forests change pretty slowly, so of course they still looked the same. I flew by Hug Point & really wished I had time to stop. It was always a favorite beach of mine. I think the first time I ever went there was with my aunt Julie. It has caves, tidepools, and an early stagecoach road carved into the sandstone. It is just a perfect little beach. Then there was the Arch Cape tunnel. My dad was the engineer who redesigned the tunnel several years ago. I always think of my dad as I pass through tunnels, but especially this one. Shortly down the road I passed by Short Sands remembering many times there with the Garry family. The walk through the forest to the beautiful little beach is such a pretty one. There was the one & only time I ever tried surfing. WAY too cold, even with a wet suit, for me to even begin to enjoy! 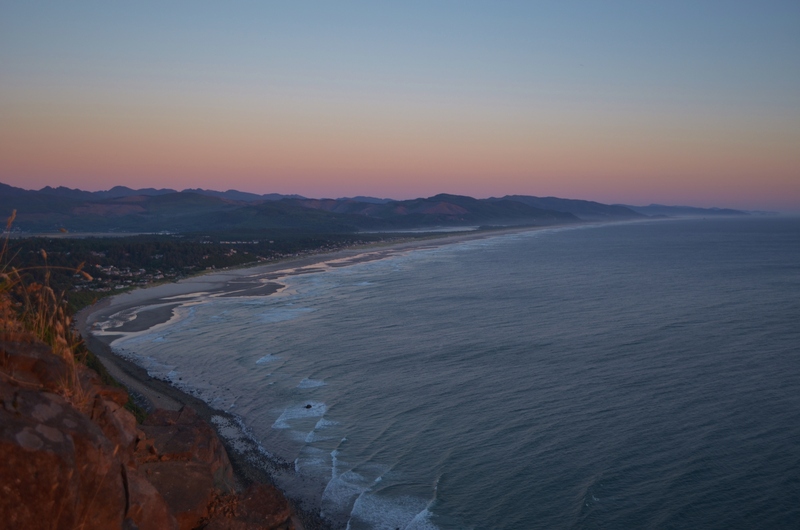 And finally, I rounded the bend & there I was, just in time for sunset…in Tillamook County & on Neah-Kah-Nie Mountain! 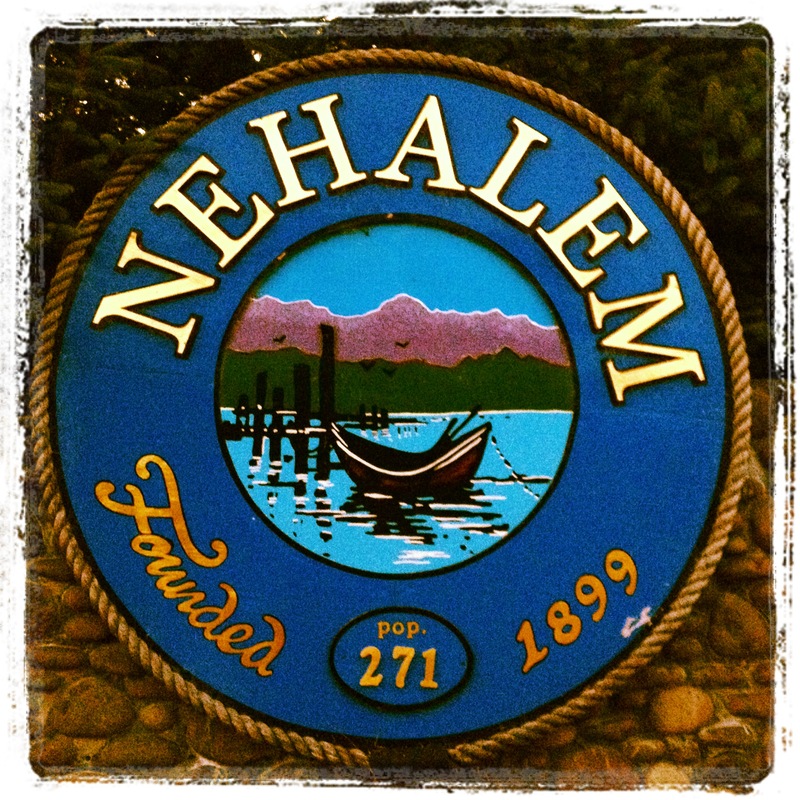 Neah-Kah-Nie is quite scenic. The original road & its many turnouts that were built by the depression era work crews in the 1930’s. The road follows an old Indian trail that linked the Tillamook & Clatsop tribes. It is carved into the side of a cliff about 700’ above sea level. 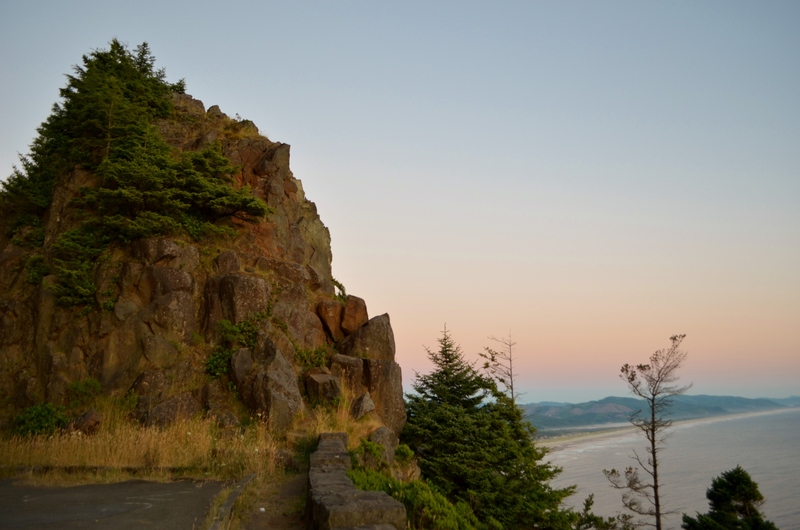 It is the highest roadbed above an ocean view on the Oregon coast. The view on a clear day, which this one was, you can see for miles & miles down the coastline. I couldn’t pull over in just any turnout. It had to be “the” turnout. The one by the big rock. I’ve watched so many sunsets from that point. I’ve also been there plenty of times at night. Its known as a romantic little make-out spot. 🙂 There’s a little ledge area you can climb up the rock to from the parking area. Its the perfect spot to snuggle up with someone to stay warm on a cool coastal night. I could see changes to the towns as I drove through… different businesses, new buildings, etc. All the things that one would expect as time goes by. Some things, though, were still the same. Bunk House coffee was still there. Tiffanie & I spent hours there in high school working on homework & just hanging out. I parked Sofia at my dad’s house in Wheeler that night. My kitties had fun roaming around his lovely back yard while I enjoyed a beer. I went to bed fairly early as I was planning to get up early to have coffee with Snuffy (my neighbor “grandpa” while I was growing up). I was also super excited to see our home & property where I grew up!